Nspire CX CAS II Coming This Year? In 2007, Texas Instruments first introduced the monochrome, oft-nicknamed "aircraft carrier" TI-Nspire graphing calculator, its very first foray out of the well-loved TI-8x product lines. That milestone went utterly unremarked here at Cemetech, rating not even a news article. 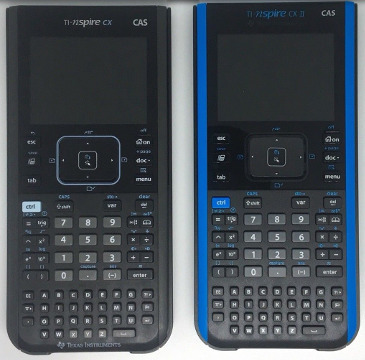 The TI-Nspire came in two forms, the TI-Nspire (without a CAS, roughly equivalent in mathematical features to the TI-84 Plus Silver Edition, and the TI-Nspire CAS, roughly equivalent to the TI-89 Titanium. 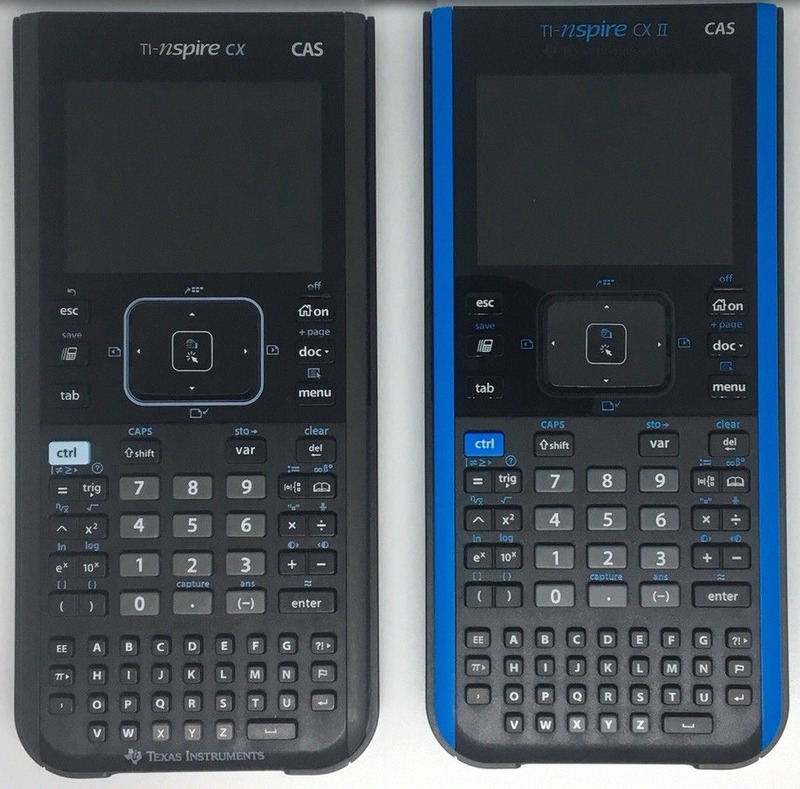 In February of 2011, TI refreshed the TI-Nspire line with color screens in the calculators known as the TI-Nspire CX and TI-Nspire CX CAS. At that point, Cemetech did pay heed, speaking out about the programmability of the TI-Nspire CX versus Casio's recently released Prizm calculator, sharing that TI reached out to announce Lua support, and eventually reaching a détente with the calculator and its makers. Since 2011, the TI-Nspire CX has not undergone any major updates. Sure, the hardware has gradually advanced, the OS has gained features, and plenty of community-written software has appeared for the device, but TI has stuck with a formula that appears to work. 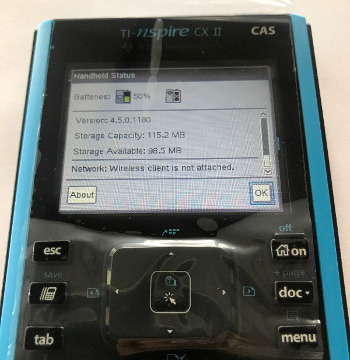 Recently, our friends at TI-Planet uncovered eBay listings hinting at a new TI-Nspire CX CAS II, and we were able to find some evidence to support the existence of such a calculator. It remains unclear what is new about this version: the models sold appear to possibly be a new TI-Nspire CX CAS II case wrapped around old TI-Nspire CX CAS hardware, the key layout is the same, and the case appears largely identical aside from those snazzy blue sides. We anticipate that TI may announce the TI-Nspire CX CAS II during the T^3 International Conference 2019, and we'll certainly be there to share the news if they do. In the meantime, good luck with wild speculation! The TI-Nspire CX CAS II with its predecessor, and a photograph of the screen (believed to show older TI-Nspire CX CAS hardware in a TI-Nspire CX CAS II shell). Click on either image for a larger version. Thanks for linking that! I never actually read the source article, due to TI-Planet being down when I tried to look at it, sadly; I heard tell of the article via IRC. I ended up finding that eBay link and the attached photos independently - are they the same ones you guys found? Cool, I assumed there would probably be a non-CAS version as well, that's nice to know. I'm not much of an Nspire guy, but I'm excited to see what TI does to improve it! Hopefully they'll try to match the specs of the HP Prime G2. Knowing TI though, they'd probably put in amazing specs but throttle it with their poor software. For the US/international (minus europe and china) version, take a look right here. Critor spent all night looking at the various pages (including china and europe variants) so the other news articles on the ti-planet pages talk about them bringing all info so far together. Fancy new colors and the usual ez-spot + "-C" chinese variants, but the -T for the european models (like the CE-T) seems to be for France as well, has exact math for the non-CAS models, and doesn't feature the extension port at the top. All seem to have some nice additions like (finally) TI-Basic drawing commands, new math stuff etc. I'll try to translate, tonight, the news articles on tiplanet for readers who don't know French. But no announcement of Python... and probably most of all, if the hardware specs are correct - it wouldn't be the first time they make copy-paste mistakes - the CX II doesn't seem to have any more Flash (same amount of usable memory announced) and might not even have more RAM (whether it's 64 MB total or 64 MB usable isn't clear). Only the processor is supposedly faster. In that case, the CX II would barely be an upgrade over a model which first hit the market 8 years ago, and the Prime G2's hardware would royally flatten it. Interesting...I recently bought a TI-Nspire CX CAS, but I may return it to get this one instead. I saw on TI-Planet that they are selling them to teachers in March, but do we have any indication of when they will be available to the general public? I got a CAS a few months ago... Hopefully the OS might be cross compatible, if not, any nerds wanna help? I got the webpage translated via Google translate, need that posted, or do you want to do your own thing? but do we have any indication of when they will be available to the general public? Not that I'm aware, yet. Hopefully the OS might be cross compatible, if not, any nerds wanna help? In such a situation, either the CX II's SoC is a faster version of a SoC backwards compatible with the CX "I"'s Zevio, or making the newer OS tailored for the CX II run on the CX I is going to be hard, especially if the newer SoC has e.g. 2D graphics acceleration (I have no clue, but even the '2013 Prime "G1" has 2D graphics acceleration, so why not having some on the CX II). And that's assuming the CX II's OS + working space its even fits in the CX "I"'s RAM, per the above. EDIT: I see at https://ti-pla.net/p239019 , Adriweb wrote that TI confirmed that the amount of memory didn't change in the CX II, it's only a matter of a faster processor. Such disappointment, as 128 MB of RAM and 256 MB of Flash clearly wouldn't have been too much to ask for in 2019, or even remotely costly. The new features are going to take up quite some additional memory, and the only way they could slow the RAM consumption growth the climb is optimizing their OS... which they never did in 11+ years yet. Also, too bad for american users who won't be able to have the exact math engine on their non-CAS TI-Nspire CX II. Apparently only the CX II-T will have it (unclear, about the -C variants). I'd hope that they've got a bigger battery to compensate for that faster (and probably more power hungry) processor. In such a situation, either the CX II's SoC is a faster version of a SoC backwards compatible with the CX "I"'s Zevio, or making the newer OS tailored for the CX II run on the CX I is going to be hard, especially if the newer SoC has e.g. 2D graphics acceleration (I have no clue, but even the '2013 Prime "G1" has 2D graphics acceleration, so why not having some on the CX II). And that's assuming the CX II's OS + working space its even fits in the CX "I"'s RAM, per the above.. If they are going to get them out to teachers in March, then I think assuming they will introduce it at T³ this year (early march) makes sense. The last time they did that was in 2015 with the CE and it only took a couple months before you started seeing them on the shelves. IIRC, they were available for purchase online (like amazon) a little bit before starting to appear in stores. I would guess they will be easy to find by early May. I'm pretty sure the TI-Nspire CX II and companions will be coming out by the end of March. Happy rebirth, Nspire ! We strongly suspect TI will announce the TI-Nspire CX II Friday morning at the kickoff of the T^3 2019 Conference, or failing that, at the closing keynote on Sunday. P.S. Stay tuned! TI-NSpire CX [CAS] II will be out soon! That was fast; one of the T^3 instructors confirmed it. We look forward to bringing you the scoop from T^3! © Copyright 2000-2019 Cemetech & Christopher Mitchell :: Page Execution Time: 0.415882 seconds.